Most Christians have massive gaps in their Christian lives because they have never truly understood Romans 5-8. Their Christian life is sporadic, defeated, and confusing. For the sake of all those who have joined in the past year, we will begin in Romans 5. For those who’ve heard these messages, I promise you that they will be richer and more developed. Romans 5:18-21 17 For if by the one man’s offense death reigned through the one, much more those who receive abundance of grace and of the gift of righteousness will reign in life through the One, Jesus Christ.) 18 Therefore, as through one man’s offense judgment came to all men, resulting in condemnation, even so through one Man’s righteous act the free gift came to all men, resulting in justification of life. 19 For as by one man’s disobedience many were made sinners, so also by one Man’s obedience many will be made righteous. In essence, the much more is that—Salvation is not just about Christ dying for my sins, it is also about Christ delivering me from the power of sin and giving me grace abounding. This morning – if you want this much more, if you’re frustrated with your Christian life, if you’re tired of your constant battles with old habits, old hang-ups and old sins, if you’re ready for the much more that God has promised, then this message is for you. There are 3 things that Paul wants us to understand about this much more of the Christian life. I. IT COMES WITH THE FAMILY PLAN. Nowadays, we hear a lot from phone companies about the share everything family plans. 1. Verse 17a “For if by the one man’s offense death reigned through the one,”Because of Adam, physical and spiritual death has come to every member of the family. Being born in Adam’s family brought judgment and condemnation to all of us. Being born in Adam’s family, we were made sinners. We did not have any choice. That’s why lost people do the things they do. They are simply living by their father’s family plan. Sadly, even Christians, even though they are in God’s family, sometimes operate by the old family plan. – They try to stop doing bad things and they do them even more. – They try to be gentle and loving and they end up getting angry and bitter. – They try to please God the old way and they fail every time. – They try to live free but they are still bound by old habits and addictions. What is the solution? You have to realize that you are no longer under the old family plan. You are no longer in the family of sin and disobedience but in God’s family. What does God’s family plan look like? 1. 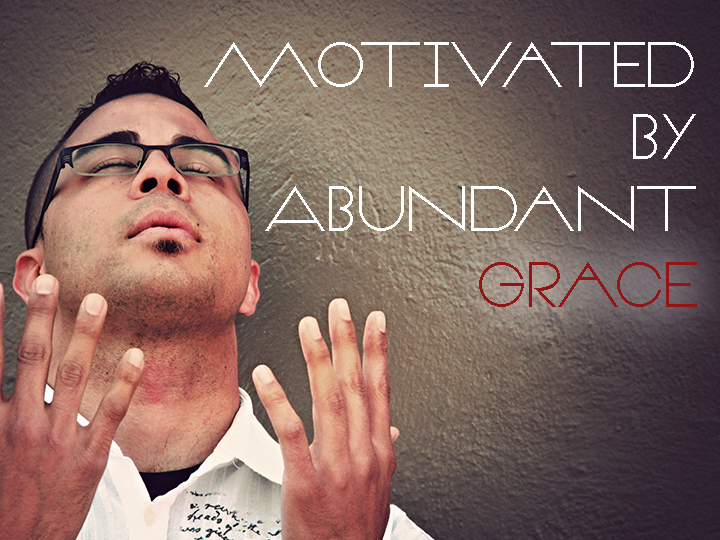 Verse 17b “much more those who receive abundance of grace and of the gift of righteousness will reign in life through the One, Jesus Christ. )”Being born in God’s family, we receive abundance of grace (not spotty, sporadic, limited) and the gift of righteousness, which brings life to all of us. Being born in God’s family, we are declared righteous by God. When I receive Christ as my Savior, God makes a transaction at that instant—it’s called Imputation. He takes my sins and puts them on Christ’s account and He takes Christ’s righteousness and puts it on my account. Meaning: Now when God sees me, He sees Christ. Being born in God’s family, we are made righteous. There is a change in our nature. All these benefits of being in God’s family have come because of the One Man – Jesus. Where the first Adam failed miserably, the last Adam succeeded triumphantly. The first Adam was cursed and kicked out of the Garden; the last Adam—Jesus—humbled Himself and became obedient to the point of death, even the death of the cross. All you can do is by faith share in your new family plan under Jesus Christ. Many Christians are trying to be righteous before God. You will never attain to the standard of righteousness that God requires. Jesus did it all for us. All you and I can do is receive by grace the adoption papers and start living by your new family plan. That’s the meaning of being born again—born into the family of Jesus and now you are all that He is. If we can only get that in our brains and our hearts, it will revolutionize the way we look at the Christian life. II. IT CANNOT BE EARNED. Now someone might say, “I am going to buy my own family plan.” Sorry, it doesn’t work like that. #1 Initially, he gave the Law to Israel in order to protect them from the Canaanites who were living in the Promised Land. In Genesis 15, it talks about the “iniquity of the Amorites.” He gave His Law to His people so that they would not become like their neighbors (Galatians 3:19). What happens when sin is stirred? Listen to the second half of verse 20 “But where sin abounded, grace abounded much more,” Literally in Greek it means—“where sin increased, grace super-increased.” God is not waiting for us to keep the Law neither is He waiting to strike us when we fail to keep the Law. To the contrary, He is eagerly waiting to pour His super-abounding grace on us. What’s the result? 21so that as sin reigned in death, even so grace might reign (rule) through righteousness to eternal life through Jesus Christ our Lord. Meaning: Where sin once controlled us, grace controls us. We no longer live in fear but in gratefulness. Application: Many people are trying to earn God’s righteousness by keeping the Law. It is a free gift to be received by grace. What is Paul’s response to the question “Shall we continue in sin that grace may abound? 2Certainly not! How shall we who died to sin live any longer in it? Meaning: Sorry, you are already dead. 3Or do you not know that as many of us as were baptized into Christ Jesus were baptized into His death? What is Paul talking about? Here is the heart of our salvation. 2000 years ago Jesus died for us. We know that He died as our Substitute – He died for our sins. But, did you also know that He died as our Representative – He died in our place. What does that mean? 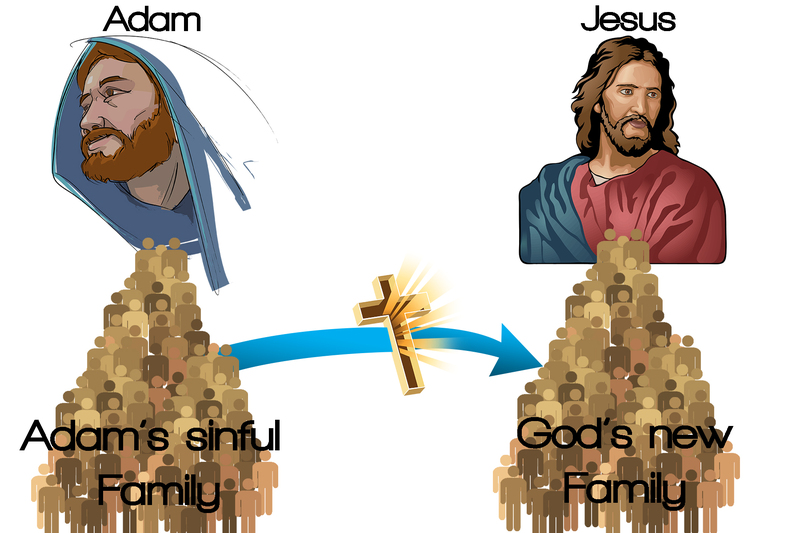 We’re all born in the family of Adam– the family of sin. We have two problems—sins (things we have done wrong) and sin (our sinful nature). Jesus took care of Problem #1 by becoming our substitute – taking my sins upon Him on the cross. He gave me His righteousness. What about Problem #2—my sin nature? The Blood cleanses us from the debt of sins but we still carry the family germ of sin that was in Adam and was passed down to us. What we need is to get out of the family. The Blood cannot get us out of the family. The only way to get out of the family is by death. Remember: God never leaves a job half done. So 2000 years ago when Christ died, He died to represent our death in the family of Adam. In the foreknowledge of God we were also crucified with Christ. Not only that but listen to verse 4 4Therefore we were buried with Him through baptism into death, When Jesus went to the grave, you went into the grave with Him. What’s next? that just as Christ was raised from the dead by the glory of the Father, even so we also should walk in newness of life. Meaning: When He rose from the grave, you rose from the grave. Did you notice the imagery that Paul through the Holy Spirit has used throughout? Baptism! The baptismal pool is really a coffin. It symbolizes our death, burial and resurrection with Jesus Christ. It tells the world that we have been united with Him in death, burial, and resurrection. It is a sign that I am now cut off to the old world and have entered into the new family. So where are we now with our sin nature? 6knowing this, that our old man was crucified with Him, that the body of sin might be done away with, that we should no longer be slaves of sin. Someone says—why do I still sin if my Old Nature has been crucified? When a person dies, it does not mean that they are eradicated. The body is gone but the Spirit lives on—either before God in heaven or in Hell waiting for judgment. Our Old Nature is no longer alive in the flesh. It is only alive in the Spirit. We have been set free. Listen to verse 7—For he who has died has been freed from sin.